Level 2 First Aid Facts For Increased Awareness. Learn More. For people wanting to develop and increase first aid skills, Provide First Aid, formerly known as Level 2 First Aid and Senior First Aid, is an appropriate choice. Real Response instructors are qualified and competent first aiders and emergency services personnel with the experience and ability to effectively teach the full range of emergency response and life-saving skills covered in the course. In addition, simulated training methods utilised by Real Response increase learning capacity and knowledge retention, providing real motivation for Level 2 First Aid course participants. Level 2 First Aid (HLTAID003) provides a first aid bridge, transforming formerly curious onlookers into responsive individuals ready to tackle any emergency response challenge. First aid knowledge is empowering, including the readily recognisable attainments gained during one or two days of intensive but enjoyable training in the Level 2 First Aid course. All major patient emergency response procedures are covered, including CPR, airway management, defibrillation, and other life-saving techniques worth knowing. As a nationally accredited qualification lasting three years, Level 2 First Aid is real value for money. Extensive attainments are gained, along with the skill-set and leadership abilities that only Real Response simulation training can uncover. First aid applications are becoming increasingly apparent where safety and security are paramount, and first aid qualifications are expected by employers across a range of industries including aviation, health, tourism, transport, sports and more. As first aid attainments become industry standard in many occupations, the opportunity for employment and career advancement become apparent. First aid attainments are an indication that safety and security of staff and visitors is important, and an opportunity to satisfy employer expectations for emergency response when low-frequency, high-risk events occur. Level 2 First Aid qualifications provide a sense of fulfillment and purpose that other mundane attainments can’t, and Real Response is dedicated to the spread of first aid and CPR capabilities as life-skills that every Australian can attain. There are a lot more reasons why it’s important to complete a Level 2 First Aid course. The few essential first aid skills and attainments mentioned above are just the tip of the iceberg. Level 2 First Aid includes a thorough overview and introduction to the treatment of non-life-threatening incidents including fractures and soft tissue injuries, while dangerous and potentially fatal incidents including strokes and seizures are also investigated. Every ailment, incident or accident is different, requiring a fast and tailored response for best outcomes. First aid skills are both empowering and humbling, learnt in only a few hours yet providing dramatically life-changing and life-saving results. It’s true there is a lot of ground covered in Level 2 First Aid. As a foundational first aid course, Level 2 (Provide First Aid) attainments include a far-reaching skill set. 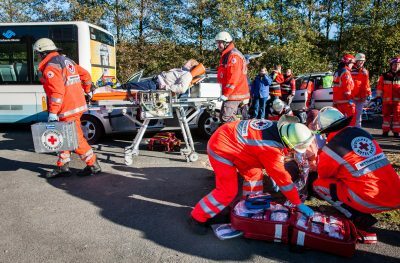 The true value of Real Response simulation training is appreciated in times when knowledge needs to be quickly recalled and applied accurately. There is little time for course revision and even less for speculation during an emergency, so Real Response course facilitators have developed industry-first immersive learning techniques that promote far greater knowledge retention. Simulation training, as used by police, the military and emergency services, provides safe replication of real emergency response scenarios and the opportunity to shine when the pressure is on for someone to take decisive emergency action. First aid attainments are valuable for both employers and employees who expect a work environment compliant with health and safety regulations. School and community groups also benefit from small Real Response class sizes and the opportunity to focus on the needs of individual students. Level 2 First Aid is ideal for health and safety managers, designated first aiders, and anyone else who requires the qualification as part of their vocation or career portfolio.